Dr. C. (Chauncey) Guy Suits received a B.A. from the University of Wisconsin and a Doctor of Science in physics from the Swiss Federal Institute of Technology in 1929. Suits joined General Electric as a research physicist in 1930. In 1940, Suits became Assistant to the Director of Research, and in 1945 he was named Vice-President and Director of Research, a position he held until 1965. During World War II, Suits headed Division 15 in Electronics of the National Defense Research Committee of the Office of Scientific Research and Development. The interview opens with a discussion of Suits' education experiences at Wisconsin and Zurich and the lack of contact between industry and universities during this period. Suits discusses his early employment at the GE Research Laboratory, offering anecdotes about Gerard Swope as well as comments on Lee Newbridge's work with GE. The interview continues with a focus on the formation of Division 15 in 1942 and Suits' work during the war. He discusses the contributions of numerous individuals to the Division's efforts, including K.C. Black, Harold Beverage, Gene Hotchkiss, and Frederick Terman. Suits offers extensive comments on the role Terman played in the Division. The focus of the interview then shifts to Suits' post-war work at GE in research management, and GE's dramatic growth after World War II. The interview concludes with a discussion of Suits' work for the Naval Research Advisory Group and the post-war transformation in engineering of the relationship between industry and universities. Interview # 042 for the IEEE History Center, The Institute of Electrical and Electronics Engineers, Inc.
Chauncey Guy Suits, an oral history conducted in 1984 by A. Michal McMahon, IEEE History Center, Hoboken, NJ, USA. This is an interview with Dr. C. Guy Suits, retired director of the General Electric Research Laboratory. He received his Doctor of Science in physics from the Swiss Federal Institute of Technology, in 1929, and joined General Electric as a research physicist in 1930. In 1940 he became Assistant to the Director of Research at GE, and simultaneously between 1942 and 1946 was in the National Defense Research Committee of the Office of Scientific Research and Development, heading Division 15 in Electronics. In 1945, he became Vice President and Director of Research at GE, holding that post until 1965. 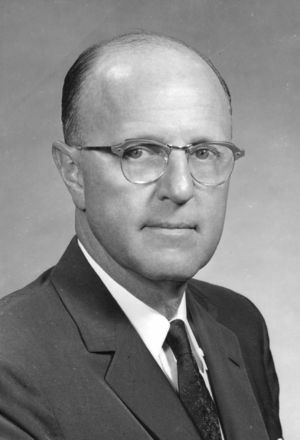 During the same time, he often served as a technical advisor in electronics for military agencies, including the Department of Defense's Research and Development Board, and the Naval Research Advisory Committee, which he chaired during the late 1950s and early 1960s. I'd like to start with the question of education; you had an A.B. from Wisconsin? Yes. I took an A.B. from Wisconsin in 1927, I think it was, and at the time I had in mind working in a laboratory, but there was quite a problem: in the University of Wisconsin's physics department, and in the electrical engineering department at that time, there was no single individual who had ever seen the inside of an industrial research laboratory. I know today that seems incredible, but at that time it was a fact of life. The professors didn't have the contacts with industry that they now have. I was quite frustrated, because I tried to find someone who could tell me what that kind of life would be, and I couldn't find anyone there who had the foggiest notion. I should go back a few steps and say that, following my B.A. degree, I applied for and received a fellowship with the Institute of International Education. I wanted to study with Pauli, who was then at Zurich. Wolfgang Pauli. He was famous for good reason — he got the Nobel Prize for his work in physics. I got the fellowship and started for Zurich, and before I got there Pauli transferred to Leipzig. My fellowship could not be transferred, so I went to Zurich, which was no great hardship, because there were some very fine physicists there. I worked under Paul Scherrer and took my degree in Zurich. Then I returned to the University of Wisconsin for another year, because I got my doctorate in Zurich a little too easily. In European universities, as you may know, there is no residence requirement for graduate work. The requirement is that you must produce a research work and pass a verbal examination. That's all there is. If you can do that, you can have your degree. Einstein got his degree from Zurich without even doing that. Well, he did actually I guess go through the formality of a verbal exam. Very informal. No one keeps records of class attendance. How was that? To go into that different structure? Well, it's great! It shows up interestingly in the student body — there were very bright graduate students at Zurich when I came, who had been there five years! They just couldn't get their courage up to attempt the verbal examination. Other students had no problem at all and sailed right through. I was there a little over a year. My research work went well, and the oral examination was no problem, so that was all there was to it. But then I decided to spend another year at the University of Wisconsin, which I did. Getting to an industrial research laboratory involved the problem of finding out what that was, and at that time General Electric sent a recruiter to the University of Wisconsin and many other universities, every year. And he set up a recruiting interview, so I got acquainted with him. He said, "Well now, you know, I recruit for General Electric, but I don't know anything about their research there! They're over there in that building five, and thirty seven, and I tell ya, you write to Dr. Whitney." So I wrote to Dr. Whitney, who was the original director and the director at that time, and he engaged me for summer work. At that time, the system was that in the research laboratory, no employee was hired permanently without trial employment, and the trial employment was usually summer employment. So every year they took on five or ten graduate students and then some of them were given offers later on. I was there for the summer of 1929 — God forbid! — and then I went there permanently in the beginning of 1930. You worked in the lab? So you were always with the lab? Yes, in the lab. I finally found someone who knew what the hell the lab was, when I found Dr. Whitney! Did you have any contact with Dr. Whitney at that time? In those early years? Did he interview you? Oh, yes, daily contact! At that time, the laboratory was small; I think the professional staff was on the order of seventy or so. Dr. Whitney held from the beginning the theory that the Director of the laboratory should be in daily contact with the staff. He wasn't involved in research, but he was keeping up with what was going on? He would go around the laboratory, and without any warning — he didn't call and say, "May I talk to you, sir?" — he would come up and drop in. And that was great! It must have made you feel really good, especially for a young researcher. Was his training in electrical engineering? Yes. He asked me questions, and he had an unbelievable memory. He had another very strange habit that I became acquainted with at that time. When Mr. Swope was visiting the Schenectady plant, he would not arrange in advance for all of his visits. He would arrange in advance for a few key people. But then he showed up at the plant before 8:00, and ran around to as many of the company officers' offices as he could. Most of the officers had not arrived yet, and then he left a little note — "Sorry to have missed you!" That was Mr. Swope's favorite trick. But anyway, he was a great guy. I was engaged in research from 1930 to 1942, and I was asked to appear before the executive office a number of times when Mr. Swope was CEO. That was a very interesting experience too, because Mr. Swope would say, "Now, I'd like to introduce Dr. Suits, who has some work he'd like to describe, and he will do this in twelve minutes." And that was it! Twelve minutes was what I had, you see! He ran the executive office meetings like clockwork: everyone was allotted time. You couldn't tell stories and pass the time of day when you were giving your report. You gave your report and sat down. So you got pretty good at twelve minute reports, did you? You're talking about in the later years, when you had managerial responsibility. No! I'm talking about the time when I was in research! Oh, all right! During the 1930s! During the 1930s to 1940s. That research was concerned with a number of things, but in the first years it was electronic circuitry — so-called non-linear electric circuits. In later years I became involved in electric arcs and high temperature plasma phenomena. That turned out to be very interesting because in the electric industry especially, the electric arc was a big mystery. Electrical machinery, as a manner of speaking, is made up of copper wires, electric fields that form coils, circuit breakers and the like. The principal unknown was what went on in the circuit breaker, involving electric arcs. The engineers in the company were very pleased when I got into this field, because it was a field where they had felt very baffled and completely lacking in any sense of design organization in phenomena involving electric arcs. So, that went on until the war period, and then things changed quite a bit. I wanted to ask you just briefly about the thirties. Did you have a sense during that time of when electronics was coming in, in terms of the broad application of the tube as opposed to the radio tube, and was that already going on when you got there? Oh, yes. That was a major activity of the company and the laboratory both. When did people start using the word "electronics"? I know Electronics Magazine really began that word in 1930, the year you came there. It started prior to my joining the General Electric Company. You see, the GE Laboratory at that time involved Irving Langmuir, Albert Hull, Saul Dushman. Langmuir, of course, made basic contributions to electronics. He invented the high vacuum, and his invention became the base of all the electron power tubes used in radio communications. That was a major patent lawsuit, by the way, which you probably knew about. When I came to the Laboratory I actually worked under Albert Hull. You couldn't have it better than that: he was a tremendous person. He's the guy who invented the first industrial electron tubes, the first thyratron. He invented the thyratron and a lot of other tubes, but that was the major one, and that really initiated industrial electronics. For the first time you could contemplate controlling a motor with electron tubes. Prior to that time, electron tubes were low power communications and related, but not power. So the power electronics thing started with Hull, and there's an interesting angle there. Hull took an undergraduate degree in Greek, and the result was that he was a source of a great many of the names for electron tubes. Thyratron is an example. Thrya is door, you see. When a new tube was coming up, whoever was in the laboratory went and talked to Dr. Hull. "What do you think we ought to call this?" He always had a Greek root that was applicable, you see. That's where the early electron tubes' names came from. Well, that period of 1930-1940 was a hell of a lot of fun. I enjoyed it, and the thing that was remotest from my mind was that I would ever go into management. That wasn't my intention. I wasn't aiming to do that! But Dr. Whitney retired in 1932. He just barely made it through the Depression; it was a very hard thing for him to manage, so Will Coolidge then became the director of the laboratory. After Coolidge was director of the laboratory maybe four or five years, he came around and talked to me one morning and he said, "You know, I need someone to help me downstairs, and I wonder if you'd be willing to spend some of your time with me?" At that time I had no idea what the idea was. I thought he was after what he said — maybe I could help him a little bit. Well, what he was after was trying to find someone to nominate for the successor to the laboratory. Well, his normal retirement would have been 1942. The war intervened, and he did not retire until 1945. Shortly thereafter (I've forgotten the date) I was appointed Assistant to the Director of the Laboratory. 1940, I think it was. Yes. Albert Hull was the Assistant Director, Irving Langmuir was an Associate Director, and Saul Dushman was an Assistant Director. Now none of those three people did any assistant directing. These were honorary titles. They were not interested and were terribly bored to be concerned with it. I had the same title, but in my case I was intended to do some assistant directing. To move into management. Let me ask you then a little about that. Did you sense a difference between Coolidge's way of working with the researchers, from Whitney's way? Not greatly. Coolidge was a disciple of Whitney. Whitney had employed him. Whitney came to the laboratory I think in 1900, and Coolidge in 1905. They were on the same wavelength. Did you see yourself modeling after them in some sense? Well, I didn't know enough at the time to really contemplate that. I had too much to learn in the trade, you see. I had not been thinking of laboratory management, and I began to think about it, so it wasn't until some years later that I knew what I thought about the management function. Before we go to World War II, now let me ask you something about Terman. You said in your letter — and it surprised me, I must admit — that you had some contact with Terman before the war. I think with the Naval Research Advisory Committee. According to your own entry in the Men and Women in American Science that was the later 1950s. I would be surprised if there were many people like yourself pulled into military advisory positions before World War II. He would have been active professionally. That's right. No, I don't believe I met Terman before the war. All right. So let's talk about World War II then, and how you got pulled into that. You have that story in the material I sent you? Yes. The war is beginning, and of course the origin of the whole thing was the Van Bush and the OSRD. Now, when was that? Was that 1942? That was being set up in 1940 and 1941. In 1941 the radiation laboratory is already established; in December of 1941 they decided to do the Radio Research Laboratory which later was at Harvard. But they began radar countermeasures research in December. Right after Pearl Harbor, in fact, a meeting was called. Right, before you went to Division 15. So I was at the laboratory frequently: I knew Alvarez, Jim Austin, and a lot of people over there, of course — I was a close friend of Lee DuBridge. Lee DuBridge spent a summer in the Research Laboratory in about 1938 or 1939. At GE. He was not interested in permanent employment; he wanted to see what an industrial laboratory was like. He was one of the few summer people who, in the course of the summer, conducted very successful research which led to a product that actually went to market. During the summer he became interested in a tube which would be used in place of an electrometer. In the case of a conventional electrometer, the current gain was very small, but not zero. In the case of electron tubes, the current gain with a negative grid should have been zero but never was. So he became interested in what causes a current in the controlled grid structure, when you're not supposed to have any current, when it's negative. That led him to identify a lot of extraneous sources of electrons, like secondary electrons from electron bombardment and the like in the tube. He isolated all those sources and built an experimental tube which had a grid current that was nearly zero. It was just barely measurable. Well, he and everybody else thought that was quite something because, as a measurement tool in the laboratory, to have a zero gain measuring instrument was just perfect. So he persuaded the company to put out some experimental copies of these tubes, because he wanted some to take back to California. As soon as the people out there heard about them, they wanted some more. It went into production for many years, and it turned out to be a first-class laboratory device. Sounds like he came in with an agenda! Well, no, that agenda came in the course of the first week that he was there. He didn't have that in mind at all. He worked with Dr. Hollow; Dr. Hollow didn't have that in mind. But in the course of his first work, the idea came to him: "My God, electron tubes aren't supposed to draw any current, yet they do draw current, and wouldn't it be fun to see what causes that?" Which he did. Alvarez was working on RCM at that time. So you're on the Division 14 Committee, but you're not working full time yet? Is that the same as the Microwave committee? And is Everett Bowles at that time still with the Committee? He leaves fairly soon and becomes Secretary of War, I think. Yes. I think in the earliest days he was. You're not full-time, but you're right there on the spot when they decide to expand that program. I'm at the committee meetings and then between committee meetings I had numerous visits to the Radiation Laboratory. Do you remember when the idea of creating a new division came up? 1941 probably. There was a great deal of discussion prior to its formation, and the formation was in '42, so I imagine that was in 1941. All right. I know that Terman was contacted by DuBridge, who evidently was home for Christmas, and by January of 1942 he's visited him in Cambridge, because he has a meeting with the IRE in New York and he accepts a position at that time. I'm still part-time then. Many people, including Conant, decided that it's not a good idea to have measures and countermeasures under the same roof, because they're essentially competitive, and they won't compete unless they have a more competitive setting. So that was discussed a good deal after Alvarez's work, and after Terman came to MIT to take full-time employment. It didn't take long after that for Bush and associates to decide that we had to separate them. Since Conant had that idea anyway, it was easy for him to say, "Well, what the hell; we have the biology building, and we don't need biologists in the war, and there's a lot of empty space there right now. Why don't we move them over there?" That was the beginning of the move to Harvard. Klaffland was treasurer, and he was a very difficult guy to deal with. Preston Breed worked under Klaffland. He was more of a manageable person, and he became associated with the RRL in the early days as financial manager. Breed was Klaffland's man, and that made Klaffland happy. His man was there, telling him what was going on financially, and there was never any question in Kaffland's mind about the facts. We had them. That took care of Harvard, because taking care of Harvard was really taking care of Klaffland. Conant was president, but Klaffland was such a strong-minded person that he would tell Conant, "No, you can't do that! We don't have the financial resources to do that, forget it!" And he did! So that's what you mean by a hard man. Yes, he was just a dictatorial individual, very strong-minded, very outspoken, and there was never any question of where you stood: you knew right away, you see! Whether you liked it or not, that's the way it was! Dealing with him like I had to do, was a very tricky thing, and my God, we had a lot of encounters throughout those years. Breed didn't serve as something of a cushion? Yes, he did, but not fully, because Klaffland was always a little bit suspicious of people in industry. He was an academician. The university is all right but you can't trust industry people exactly. Harvard, I suspect, not like MIT, didn't have that many programs that reached into industry. Exactly. It was worse than that. A professor at Harvard prided himself on NOT having contacts with industry. It was a little sinful. At MIT they had heard about industry, and even more than that they were willing to even associate with people from industry. At Harvard that was a background which had not yet changed, but it did a great deal during the war. Of course. As everywhere, I suspect. So, sometime during that period, Van Bush called Swope, and Swope called Dr. Coolidge, and Dr. Coolidge recommended that Van Bush talk to me. I went down to see Bush later, but the first contact was by telephone. It must have been late in '41. He's already contacted Terman. He's contacted you. He's putting together that team, and he's talking already about you leaving GE or at least taking some kind of a leave of absence. Is that what it would have been called? It was very hard for the lawyers to work it out. If I had taken a leave of absence, the question of my pension and seniority rights was involved. I wasn't a member of the union, but the union had strong definitions of seniority rights in their context, which the legal people thought didn't really apply to us, but we couldn't completely overlook it. So the final solution was that I retained my GE employment at the same salary, and the OSRD reimbursed the company for my salary. That meant that while I was officially a GE employee, I was 100% assigned to the OSRD, who paid my salary. So you joined them in the spring. I know you take a trip to England sometime in that spring of 1942. So you're already on staff at that time. Where are your offices though? We set up offices in the Empire State Building in New York. And you stayed there through the war? My office was in Schenectady. The Division 15 office was set up in the Empire State Building. So you're moving between there — or are you very often at the Radio and Research Laboratory? Well, I doubt if I was at my office in Schenectady on the average not more than one or two days a week. The other times I was in the New York office of Division 15, at the Radio and Research Laboratory, and in Washington. I was at the OSRD office frequently, and frequently at the offices of the armed services people concerned with countermeasures, including the Naval Research Laboratory. So I was on the run most of the time. Besides the Naval Research Laboratory, what's the constellation of institutions that you remember Division 15 working with? Very early in the work the Airborne Instruments Laboratory became part of the act. And the Division had contract work underway at the Bell Telephone Laboratories. Do you remember who was at the AIL, by the way? K. C. Black was in charge. Do you remember William Rambo? Oh, all right. Was he an engineer? A research engineer? Yes, he was. I didn't know Rambo well; he was one of the recruits that Terman made. And yet he was at the AIL, was he not? Or am I mistaken in that? You're probably right, I'm not sure. I'll know more about that later then. So, the AIL — and you mentioned Bell? Who did you deal with there? K.C. Black was our principal contact there, but we also got Hale Moore from the Bell Telephone Laboratories, who became a second technical aide for Division 15. The first technical aide in charge of the New York office was Robert Larson. He was an assistant of mine and John Leche, and he took the same arrangement of working full-time with Division 15 during the war. Then we employed Eugene Hotchkiss from the New York Telephone Company, Schenectady office, who was in charge of Division 15 personnel. Personnel was very important, because finding the people was the critical item. Gene Hotchkiss, extremely able in this area, was our principal reliance in that. He was constantly on the trail of individuals who could be persuaded — or companies which could be persuaded to give them up for a while. This included the CBS group under Peter Goldmark. They shuttled between Cambridge and New York for awhile, and they finally decided that wasn't working out well, so they set up to work at CBS full-time. So you must have had so many people under you. What was the Radio and Research Lab's place and function within that constellation? Well, in terms of dollar volume, I think that RRL must have been about 60% of the total volume buying division. We had work in progress at Bell Telephone Laboratories, which was principally communications countermeasures, in charge of K.C. Black. We had some work in progress at RCA, which was sporadic and not as continuous. We had a great deal of contract work with the General Radio Company, the General Electric Company, and the Westinghouse Company for electron tubes. Not solely, but principally electron tubes. And so forth. So we had quite a large number of contractors who were putting out various requirements of the division, most of which became embodiments of equipment that entered design stages at RRL. There were some that didn't go that route, but most did. Designed at RRL and then subsequently put into industrial production someplace. Where would the idea come from? Well, the idea came from a lot of sources. Terman took a trip to Europe, and he came back with a lot of ideas. What did he do in Europe? He visited the telecommunications and research laboratories, and especially Dr. Coburn. Coburn was in charge of the countermeasures work for the United Kingdom. He was crying for help because he didn't have many people — I think the whole effort in that entire laboratory was thirty, possibly forty professional people. At the Telecommunications Research Laboratory. Where is that in England? That was near Great Morelford. Yes. That's where ABL 15 was set up, for that reason. It was near the major airport — I think it's Farnbull Airport. ABL-15. American-British Laboratory, Division 15. When Terman went over there, this was his introduction to countermeasures to a large extent, over and above what he had learned from Alvarez and the people at MIT. He was impressed by the accomplishments of the British. They then had their early warning radar in use, and they hadn't gotten into jamming the Wurtzburg — that is, the very high frequency, 500 megacycle, German equipment — yet, but they were thinking of it, and they needed everything. They needed people, but they didn't have any tubes. They didn't have all the things they needed. So when Terman came back, he was not lacking for things to do. We needed search receivers. We needed tubes for a great many different frequencies. There was no tube available in the 500-megacycle ramp band, which had little appreciable power output, hardly enough for a receiver, and here we had to consider jamming that frequency! There were major problems all over the place, all at once. Terman was very busy getting all of these things underway, and he got some very good people to help. Wynn Salisbury and John Burn. These were people who just bailed him out in every respect. Have you seen this book yet? You'll find a lot of this discussion we're going through now is outlined in here pretty well. You'll also find that it is a little more technical than you need, but it gives a lot of information. Here's Van Bush, here's the OSRD, Tim Coolidge and Carl Compton, and here's the Radio Research Laboratory biology building. Here's Terman at RRL. There's Dr. Earl Cullen, a liaison, a very important assistant for Terman, Williams Salisbury, another important assistant for Terman. This is Carlton down here. Here's John Byrne, and those were principal assistants, but he had a lot of other people too. Yes, he was a student and a teacher. Were Byrne and men like him the innovators? They were the innovators. Just a minute, I'll get some more names. Do you remember Karl Spangenberg? No, I don't. I want to be sure to mention Harold Beverage. Well, Beverage was a vice president of RCA. He became a member of Division 15, and he sponsored a good deal of work at RCA concerned with antenna. He was a specialist in antennas. He was a regular attendee at our meeting, and followed the work very closely. Dr. K.C. Black I've already mentioned. John F. Byrne. Another man at Bell Telephone Laboratories that we dealt with was Mark E. Campbell. He was concerned with communications specialties. John Christianson was an early member of the Radio Research Laboratory and a very productive individual. Ralph L. Clark was important. I should mention Professor William G. Dow, from Ann Arbor, he was in the Laboratory. In the later days... John Dyer should be mentioned. He was a very important individual for Terman; he subsequently became post-war director of the Airborne Instruments Laboratory. John Hare was the director of the Laboratory during the war. Where is the Airborne Instruments Laboratory? Was that an independent laboratory? I can't tell you the origins of that laboratory prior to our acquaintance with it. But it did work for one of the other divisions, completed the work, worked itself out of a job, and we took it over in the middle of the war. Did they work exclusively for Division 15 then? And then they have a life after the war, do they not? Or do you know that? The AIL, doesn't it go on? Yes. After the war, Hale went somewhere else. I had no contact with him since the war; nobody's seen him. John Dyer became director of the laboratory, and they took on an industrial association, and I can't tell you what the company is. Other names that are certainly important are Captain W.G.H. Finch, U.S. Navy; he was our point of contact with the Navy during the war, on Congress; he had some associates that worked with him. One was David T. Ferrier, Lieutenant; he was mostly assigned as liaison to the Radio Research Laboratory for the Navy. That must have been a very important liaison, because the Navy was obviously quite concerned with this. Most of the work at the RRL as I understand it was at the high frequency range and not the ultra-high frequency range. That is, microwave work was not at the heart of what they were doing. Yes. None of them had 3,000 cycle microwaves, so we were not in that range at all. The highest we went was the 500 megacycle range, which was the highest the Germans went. Your program was determined by the Germans' program, in other words. Right. Now, very late in the war there were some 3000 megacycle equipments found in the hands of the Japanese, but I guess they never actually got into use. They were pointing in that direction. George Haller was at Penn State College at the time, running the Haller, Rims and Brown Laboratories, I think that's the name of it — they did work for us during the war, for Division 15. Contract work you're talking about? Contract work, yes. After the war, Dr. Haller joined the General Electric company and became Vice President of Advanced Technology. Frank Lewis, from the General Radio Company, was a very valuable member of the Laboratory. He was not on the Laboratory staff all the time, because he took quite a number of assignments, one of which included going with me throughout the Pacific late in the war, but he also went to England and became an important OSRD while there, for a period of a year and a half or so. During the war, did you have people going back and forth to England? Now, you and Terman didn't return during that time, did you? No, I went over once. And Terman just once. We had a lot of people going over there, especially after the ABL 15 was set up. Don Sinclair was very important. He was president of the General Radio Company after the war. Where was he working? Was he working at General Radio? He was at General Radio at the time. And he stayed there doing contract work, in other words. Do you remember the kind of work Sinclair was doing? I think search receivers. Oswald G. Villard Jr. worked at the Radio Research Laboratory, and was a very valuable member of the staff; Norman Winter was an important member of the staff; I guess those are the names on my list. Why don't we move into post-World War II, then? You come back as Director of the Lab, is that right? Vice-President and Director of Research. Is that the same as being director of the Research Laboratory? And policy and strategy responsibility and counseling about thirty company laboratories associated to the operating divisions. So you moved heavily into management, it seems like! Yes. From that time, I couldn't do any individual research anymore. During the war I was [unintelligible] all the time, I couldn't do anything. That's interesting. I wanted to ask you about electronics after the war. What changes in that regard? What do you remember as being new? Well, of course, there was a strong suspicion on everybody's mind that post-war things were going to be beyond vacuum tubes. When did you first have a sense of that? December 1947 is when they make the discovery of the transistor and they announce that at Bell in the summer of 1948. I suspect no one knows about that, not even at GE, before that time. Is that so? They were secret in fact for a few more years after that. Is anything going on at GE on solid state? I mean, are there other places in the country where they're working on that? Yea, but not to the extent of Bell Telephone Laboratories. Prior to the war, Fred Seitz, who is really the theoretical father of solid-state, spent either one or two summers at the GE Research Laboratory. Yes. At that time, he tried to interest people in solid-state. But during those days, theoretical development had been quite impressive and substantial, and the problem was there was almost no experimental phenomena that would support the theory. We didn't have pure silicon, and we didn't have a lot of other things that you need to demonstrate solid-state phenomena. Fred Seitz, for quite a period of years — I think he's from the University of Illinois — was sort of a professor without a retinue. I mean, he had this beautiful theory and students that were skilled in the theory, but there was almost no experimental component. It was kind of like a cry in the dark — some people believed it, and some people didn't. The people who didn't said, "Well, if that's so damn good, show me how it works," and he couldn't. It was really the experimental work that Bell Telephone Laboratories did that got the thing going, although there was some work prior to that. For example, solid-state rectifiers were an article of commerce. The copper oxide rectifier was a solid-state device used to charge batteries, to produce DC, and there were other types of solid-state rectifiers. There wasn't any three element device and of course that was what the Bell Telephone Laboratories contributed. These solid-state devices that preceded the Bell Telephone Laboratories work did not require high-purity materials like modern silicon. You could use dirty copper to make a copper oxide rectifier. You can't use dirty silicon to make anything! You said that Seitz couldn't demonstrate his ideas, so it was hard to interest anybody. Was that so at the GE Research Laboratory? We asked him to come because we were interested, you see. Yes. That's the late 1930s you're talking about, right? Yes. That did give us a good understanding of the theory of solid-state, because he was the principal exponent of it, such that we had a lot of people who were willing and anxious but nobody exactly knew where to begin. Did you think that Shockley probably had a clear idea of how to begin to demonstrate that at Bell Laboratories, so therefore they were willing to appoint a team to work on that? I think they developed a sharper focus than we did on the idea of a controlled element because their terms of reference — I think it was from Mervin Kelly — were to see if you can demonstrate that effect. So, at GE after the war, you're still working in tube electronics. We had a lot of tube electronics, and the tubes were very exciting, because the tubes had been very small and very powerful. Yes. Do you remember them getting small right in 1946 and 1947? When does that miniaturization really begin in earnest? Is that during the war? No, that's prior to the war. It was an intensive activity; and very productive. These lighthouse tubes — little tiny tubes — had very high output, very high frequency. That was the head of the period at that time of electron tubes. The lighthouse tube, you mean? Is that a nickname for just a small tube, or is that a specialized function? That's the name that comes from the structure of the tube. It looks like a lighthouse. A series of disks, you see, in cylindrical form. At the end of the war I wrote a foreward to a summary technical report of Division 15. Why don't I run copies of this for you? You asked what I thought about electronics at the end of the war, and I'm going to tell you, because what I thought about it I said in here! Good, it'll be nice to have that then. Let me say it before I forget. There was a dedication to Terman about a year ago. A plaque to Terman? At the building on the Harvard campus? Where the laboratory was? I did[n't?] know about that. You remember the Old Crows? I'm not a member of the Old Crows. But they invited me to come over, and they put out a little booklet which includes this item. Is there a fellow named Albert Ormand? He's pretty much their secretary in some sense. I wanted to ask you about Terman as a personality during the war. I have only talked to a few people at Stanford about this, and I'll be talking to many more. I have no sense of what kind of person he was to work with. I believe some people in the physics department at Stanford felt like he ran roughshod over them. Of course, he's the one who rose in power in the research, in terms of making research policy. What sense do you have of that? I have no feeling for his university relations at all, but in the contact I had with him, I found him to be a very reasonable person, very helpful, very cooperative indeed, and I don't have any complaints at all. He was easy to deal with; he didn't have a reputation of being hard to get along with at all; the students, of course, were very fond of him, because he had given so many of them a start in industry! He was quite concerned with that, I think. Yes, he was. He knew about industry, [unlike] some professors, and I think that students who were looking for jobs could call on Terman and Terman would help to find them. They held him in the very highest regard. I had heard that in terms of research some had said he was quite good at helping someone over a research problem. As you say, he wasn't innovative but he could listen to what they were working on and sometimes suggest some tack. I presume that was the case, but, as far as the Radio Research Laboratory goes, there was, I think, no evidence of any innovative contribution on Terman's part. He was very supportive of the innovators he had, and he would certainly be able to help them over any electronic engineering hurdles, but I don't believe he ever said, "Well, there's a better way of doing this; I think we ought to turn this thing around and add some more wave." He didn't do that, you see. He was a student and a teacher. Those were his strengths. Well, as a lab director, does that seem appropriate? I mean from your experience, what would you want? Well, I would like to see a little more innovation. If you're going to have innovative people, you mustn't be stupid about it yourself. I mean, they look to you to have an idea occasionally, and I don't know whether Terman ever filed a patent. Do you know? He developed something called a C tube in the '30s, and he might have filed a patent on that, but that is something I'm going to be looking into. I don't have that information, but I'd like to know. I would be surprised if he had any patents, but maybe he did. At least with all the contacts he had he should've had a few patents just by acquaintanceship. It would be hard to avoid it! Yes, I would think so. So what would he have brought to advisory committees? Would he have brought just a tremendous amount of knowledge, information about what was going on in the field of electronics? Yes. In the case of an advisory meeting, especially concerned with what the enemy's doing, there were always a thousand technical details where Terman could make a contribution. For example, could you do that? Speaking, say, of a search receiver. The question was, could any search receiver do that? Well, Terman could tell you whether that would be a feasible thing for a search receiver to do. I don't minimize his contributions in any respect, you see. I'm simply pointing out the nature of his contribution. His leadership by virtue of his personality, his acquaintanceship, his knowledge of the trade, was excellent. I understand that was Bush's idea in bringing him in, that he was president of the IRE in 1941 and he had been very active in the AIEE in the 1930s, so he must have had a tremendous body of people to call on. Was your only contact with him in post-war advisory work, later when you were both on the Naval Advisory Committee? I think the only post-war contact was in various committees. You and he were both on committees, but never together until that time? I never visited Terman at Stanford; I never had any occasion, you see. Our meetings were all always on somebody else's property, somebody else's occasion, where we were jointly involved. They were always very pleasant indeed, and I always enjoyed meeting with him. Of course, you know about the post-war Division 15? The first year following the war, we decided that we would have a post-war Division 15. As soon as the idea came up — and I'm not sure whose idea it was — everybody was enthusiastic about it. We set up an organization that was characterized by lack of organization, mainly — we just found someone who would be willing to be chairman, and sent out invitations, and kept a mailing list up to date. We have had an annual meeting, usually on the weekend of the IRE convention, every year since, including this last year. Now, I am a bit concerned, because we only had about thirty at the meeting this year, and the ranks are obviously getting a little thin. Is it a kind of a reunion? Until about ten years ago what we used to do was get an outstanding speaker each annual meeting and be host to him. In more recent years, we haven't had enough at the meetings — thirty to forty, originally 150 — so we haven't felt justified bringing a prominent individual into a small meeting. Although I am sure some of them would've been willing to do that. Sometimes that's more fun than speaking to the larger group. Yes. What we do is trade experiences every year. Everybody tells what's going on down his way. Did Terman go at all? Yes, he attended nearly all of these meetings until about the last three years, when his health was not up to it. Would you see him then at those meetings? Yes, from time to time. Those meetings are very unusual. I am told, and I have no evidence that this is otherwise, that this is the only division of OSRD that has done this. Some divisions did for about five years and they gave it up; but we've been going ever since the war! How can you explain that? I wonder. Well, the only explanation I have is this. During the war, because of the very tight security, the cooperative relationships between countermeasures scientists and engineers were extremely intimate. You couldn't talk to people on the outside. You had to talk to somebody and so you talked to your associates. The internal flow of information was at a high level. The flow beyond the boundaries was almost zero. The boundaries were too tight, as a matter of fact. Characteristic of this problem was the way we dealt with receiving new enemy information and new information from the armed services, and getting information from us to the armed services. We started a series of Division 15 smoke-filled conferences, usually about once a month, sometimes at RRL, more often in Washington, and occasionally in New York. The attendees would be the principal investigators at RRL, including Dr. Terman, plus our principal Navy, Air Force and Army liaison people, plus occasionally principal contract representatives like Don Sinclair of General Radio, and so forth. At these meetings, which usually started after dinner and lasted until midnight, everybody who had something to say would talk. For example, in the laboratory the question was, "How is the so and so receiver coming, which we badly need?" Howard Chen for example might be working on that. He'd talk about it, the Navy people asked the questions that they wanted, and so forth. In other words, it was our primary information exchange on a technical and military level. These meetings took place throughout the whole war. Well, that couldn't help but develop quite a bit of camaraderie. Now in our Division 15 post-war, these service people became members, and they attended just as regularly as the RRL people did. I mentioned — no, I didn't mention Captain Detser. He was a principal Navy officer; I did mention Lt. Ferrier, Captain Finch, and a lot of others. But you see, the war-time relationship was so special with respect to communications, that it couldn't help but extend almost inevitably into the post-war period. It was a very natural thing for the division to get together, because this were really an extension of the smoke-filled conferences we had all during the war. Did you bring anything back to GE? I mean, did you have a sense of gaining something for GE and for your work there out of your war experience? Well, the principal thing I brought back to GE was the acquaintanceship with some very able people. Quite a number of them came to the GE Research Laboratory following the war, like Harvey Burkes, Jim Lawson, John Good, and so forth. A lot of the people that I observed or was partially associated with during the war I brought back to GE to the extent that I could because I had in mind a great expansion of the GE Research Laboratory, which we did accomplish post-war, and then moving out of the Schenectady plant where the laboratory was originally. We built this new site at the Knolls, moved the whole activity out there, and I expanded the GE Research Laboratory operation by a factor of about three. The most important thing in that was to find the people. Who was the director of the lab itself after the war? So you were director of research, and also the Director of the Lab! My responsibility was divided between the directorship of the Research Laboratory and the company-wide activity concerned with research and development. Did you have some principal deputy that was at the lab on a day-to-day basis? Yes, I had about six. We were organized at that time in departments. These people reported directly to me, and they had a large amount of authority. For example, the membership of the department had a large degree of authority to run their department. I didn't have anybody between me and them. There was no assistant, you see, but the laboratory department managers ran the laboratory in their area of expertise. Were they involved in research? Did they remain involved even as they directed it? Was that something you would insist on, I mean, that you wanted? I wouldn't insist on it but it wasn't necessary. To the extent that they could find time they became involved. But about half their time was directly administrative; about half, properly speaking, was research. Now, in the position of a department general manager, that individual had reporting to him probably thirty or forty or fifty Ph.D.s. He could not help but be involved in their research; it was his area of skill and knowledge where they were working, and so he or his were a part of that act. Were you part of the hiring of any senior research personnel? Even though they would perhaps recruit the man in their field, you would always want to talk to them. I personally hired a great many of them. Oh really? Again, probably out of this war experience, and then they would go into these specialized departments. When did you start thinking about management, R&D management? I mean, in the sense that it became almost your field? When did you have a sense of that happening? It happened awfully fast, because the moment I got back from the war there were a thousand things for the General Electric Company to do, and for the laboratory to do. We had two Charlie Wilsons, one from General Motors, and one from General Electric. One was Electric Charlie, the other one was Motor Charlie. Motor Charlie very quickly began accepting government positions, didn't he? I mean, before he was Secretary of Defense? Or was it the GE Charlie Wilson? No, GE Charlie Wilson came back to [the Junction] At the time, GE went into the war, gross sales of General Electric were I think, less than five hundred million. Charlie Wilson had the conviction that the company was going to go racing. He was talking about two billion within a few years! Nobody believed him! Everybody thought we'd go back to [where we started] But that wasn't his idea at all, you see. He knew what the hell was coming! I worked very closely with him, and you couldn't find a better person to work with than that. It was a while before you got into the two billion mark, wasn't it? It wasn't very long! You know what it is now, twenty-six or twenty-seven billion. So, his concept was, we aren't going back to the same old company, we're going to have massive growth, and he greatly encouraged not only me but all of his associates to look to war-time people who they knew, who could grow with the company, and bring them into the company. Now that was a little different from the theory of a much earlier period, let's say under Gerard Swope. Then the tradition was, when anybody gets promoted, they're from the ranks. We don't go outside and bring people in for the most important jobs; we take the people we have trained for the work, and of course they get the jobs. Well, Charlie Wilson said that at that period of growth that was probably a good idea, but that isn't what we're facing now, and now what I want you to do is to consider the very best man you have at home and then find the very best man you can find on the outside. And then make your choice. He said, "Over the next ten years, I want to find, in our major managerial staff, at least thirty percent that have come from outside the General Electric Company. We are not going to be in-grown; we're going to spread our wings. If this happens to be within our own ranks, that's fine. If it doesn't, then we'll go to where we have to find it." Hmm; that's quite interesting. So that was new policy? In terms of your work in management: You were also carrying on this advisory work with government agencies; the National Security Agency very early on, and the Naval Technical Advisory Group later. I know that must be, in your memory and in what was going on at the time, a very small part of your work in terms of time. Did you see that as extremely important? Well, I think it was all important in some aspect. For example, I worked with the Merk Management Association for a long time, and pre-war industrial research was not really conducted along management lines; it was conducted along science lines. Innovative techniques. Whereas, post-war, things got so big, that in the company itself it was necessary to raise the idea of professional management techniques in research. Post-war, that was a sort of novel idea, and in some parts of industry it they resisted the idea that people trained in management would have any function in work of that kind. But I worked for the Merk Management Association for a number of years. Right after the war? All right. I was thinking that that was much later. I'm not sure, but you can find it. They had a research division in the Merk Management Association; President and Vice-President for many years, and I worked with them, which was a good working experience, because I had some reservations on management techniques. For example, the man trained in management who knows nothing about a business and says he can manage it! I had always thought that you can have the techniques, but it'll do no harm to know what the hell the business is at the same time you're doing it! Did you retain that belief? That's being talked about a lot again today, obviously, with the so-called deindustrialization. The Naval Research Advisory Group was another matter; I regarded that as a duty. The Navy had a lot of R&D. They were spending money like mad and have ever since. They had a lot of people to look to for advice but those people were principally contractors. The contractor has a problem: he has two sides to his coin. He can't be completely arbitrary in his judgments. I thought, and still think, that it was very important for the Navy to have a kind of independent source of advice on major technical efforts, which was the sort of thing they brought to our attention. For example, we saw the Polaris submarine long before anybody else did, when it was still an idea on the back of an old envelope, and so forth. Where would you get people for this? About half of these people were from universities and half were industrial research directors. How would that not fit into the contractor role? For the people from General Electric and General Motors, it was unavoidable. You couldn't help it. All right, yes. You had to go there for the top people. You had to face the fact that the only alternative then would be to have university professors only, and that would be too much of a price to pay. You wanted the best university professors you could find, especially in engineering, but you wanted somebody who knew what was going on in industry. Then on that committee you would have been a member from industry and Terman would have been one of those out of the university. What would you do with the Naval advisory? What we would do was simply this. At each meeting, the Navy would generate an agenda with seldom fewer than three items — sometimes half a dozen items — involving major R&D ventures in progress in the Navy on which they needed counsel and advice. They had gone so far with the Polaris missile, and they had some very serious problems. The Navy itself was divided; they had some people who said it'd never work, and they had some other people who said, "Of course it'll work! We just haven't got it to work yet, and just wait a while and it'll work." So it was up to us to give them the best advice we could. So they would know whether to continue and who to believe. That's right. Now our advice wasn't infallible by any means, but it did reflect a different background than the Naval commander assigned to that project. He had a role to hold because that was his assignment. That was interesting from the standpoint of the participants, but I'm sure it was valuable from the standpoint of the Navy. Yes. How frequently did you meet? I think we met about four times a year. I guess you would get a lot of information in. We had an agenda well in advance of the meeting and fully supported by a great deal of information. As chairman, what did you do? You were chairman of that for several years. Well, I was chairman! I did frequently suggest things that we ought to take a look at, some of which the Navy had in mind, some of which they weren't thinking of at the time. Then I suggested to the Navy that in addition to merely meeting in Washington routinely, it would be valuable from our standpoint to meet at some of the establishments. So we would largely meet at the Naval Research Laboratory. We would meet at the Langley Towing Base. We would meet on an aircraft carrier. Each time, the value to the members of the committee was to see what the Navy facility instrumentation was in various fields. That was very helpful to us — not helpful to the Navy, who knew. It was helpful to us in advising the Navy to develop a feeling for their competence. Meeting their people was the most important thing — did they really have the competent people to do these things that are required? And did they have the facilities and the organization that goes along with it? For example we met at Point Magu in California. At the time they were firing their first guided missiles. We saw them firing them. Is that early-to-mid 1950s? That's all right, but it's clearly some time in the fifties. Find the date of Point Magu, and it was very early from the date of the establishment of Point Magu! Just as an aside, my grandson is now at Point Magu, flying the Lockheed Orion for the Navy. Is that right? That is interesting! Your son went into engineering...James. James, yes — he's a physicist. He works for IBM, at the laboratory in California. I know that because he comes right after you in the American Men and Women of Science. My other son is David; he's a pilot with United Airlines. In terms of the professors and people from industry, could you sense a different contribution? How would that work? Yes. The contribution really was a reflection of the backgrounds. The people from the university had a very important contribution to make, because these were the top individuals in universities, like Terman, and when they advised the Navy concerning matters in electronics, it was likely to be very authoritative advice. In fact, you couldn't go any place and get better advice in that field. That kind of advice from the universities was outstanding; it was different from the advice they would obtain from the industrial participants because of their background. They in turn could advise the Navy on the organization of major projects, and their pursuit, because in their own organizations they had much of that in progress themselves. So the organization and the conduct of major technical efforts is what industry contributes. The advice concerning the basics of the science and technology, and especially the advanced engineering aspects of it, were the things that the university professors would contribute. Information and experience, the two sides. Obviously industrial people had information too, but they had that fine experience in organizing projects. Many of these were set up after World War II, and that bridged the difference in some sense. You see now, the major accelerator projects are major engineering projects in themselves. The difference between the industry and the university that formerly existed is progressively diminishing. You've seen that through these several decades then, since the war. Yes. Prior to World War II, this was a major difference. I know that you can find a professor even today who prides himself on not knowing anything about industry. But they're not in engineering departments. They may be in the English department, even in economics, you know, but even there I think that would be rare. Oh yes, I have friends at the University of Pennsylvania, and they know industry. Prior to World War II, you could find them all over the place, the experience I related at the University of Wisconsin. I couldn't find a single person in that whole university that had ever seen an industrial research laboratory on the inside.